1. Heat the vegetable oil in a large frying pan or wok over a high heat. Once the oil is hot, add the prepared salad onions, garlic and chicken. Stir-fry for 2-3 minutes, until the onions start to soften and the chicken is lightly browned. 2. 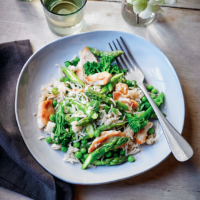 Add the prepared asparagus and Tenderstem broccoli and continue to stir-fry for another 1-2 minutes. 4. Stir-fry everything together for about 2 minutes, or until the chicken is cooked through with no pink meat remaining and the rice is thoroughly heated. Take the pan off the heat and stir in the kicap manis and sesame oil. 5. Serve the fried rice with chicken and greens on 2 plates. Garnish with a few sprigs of coriander, if you like.